I love pizza so trying to make grilled pizza seemed like a no-brainer. I have some other great pizza recipes that I have shared. Take a look at my delicious breakfast pizza and easy campfire pizza’s which have been big hits. 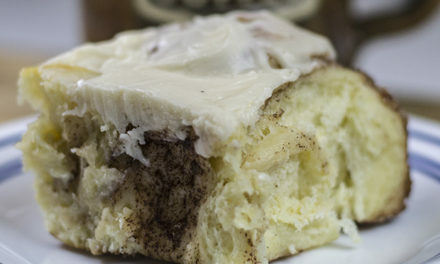 With this recipe, I am also including Bobby Flay’s dough recipe. I think pre-made pizza dough is delicious and easy, but making your own dough is fun and easy too. I usually opt for the pre-made dough because it saves a lot of time. The dough is the most important part of the pizza. Sure the sauce is really important too, but if the dough is bad or not cooked correctly it can ruin the whole pie. That is why I use a good quality pre-made dough that I think is delicious. I also think that making your own dough is fun, satisfying and easy. It takes a little more time but if you have the time here is a recipe for Bobby Flay’s pizza dough. Ingredients on a grilled pizza. Some great sauces for pizza include Alfredo, Puttanesca, or Pesto. Red sauce has always been the most popular, but experiment with different sauces, it can change your pizza into something amazing. Jarred sauce is, of course, the easiest option. If you have a great sauce recipe, please share it with us in the comments bellow. We would love to try it! People make pizza with cheeses other than mozzarella, but mozzarella really brings out the flavor of the other ingredients well. Of course, it is your choice, but I love mozzarella on my pizza so that is my cheese of choice. I used shredded mozzarella cheese in this recipe but a fresh mozzarella is a great option too. Just slice it small enough to melt quickly. Oh and do not forget the parmesan cheese. Pizza toppings can be anything your heart desires. 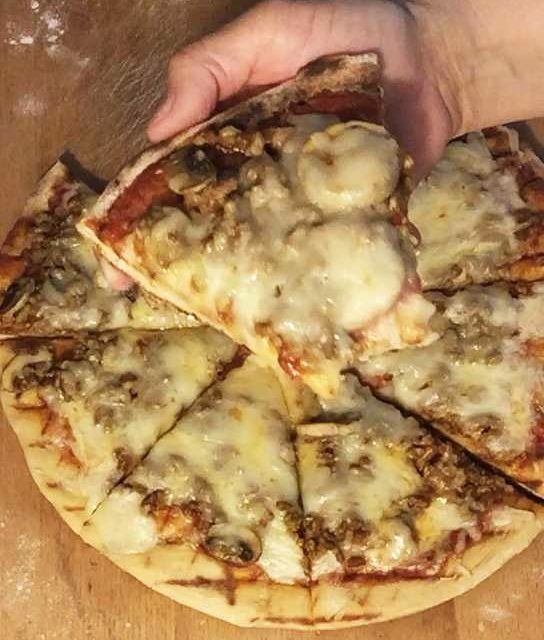 My favorite combination is sausage and mushroom, but I’ve had more interesting ingredients such as baby shrimp, eggs and artichoke hearts on my pizza’s in the past. Do not be afraid to experiment with your ingredients. Some of my most interesting dishes were experiments turned to a full blown recipe. I love a good cooking challenge so I’ll play with ingredients. I’m toying with the idea of a Polish pizza now. Stay tuned for that recipe. 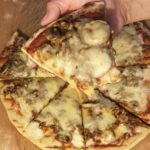 Grilling pizza is a great option when you want to make pizza but don't want to heat up the house with the oven on those hot summer days. If you are making your own pizza dough prepare it ahead of time so that the dough is ready when you need it. If you are using pre-made pizza dough, remove it from the refrigerator about 30 minutes prior to making the pizza. Pre-cook the sausage and mushrooms. Pre-heat the grill to about 450 degrees F. Scrap off any charred food pieces left behind from your last grilling experience. Spray or brush oil on one side of the dough and place on the oiled side down directly on grill grates. Close the grill lid and let cook for a couple of minutes. Check for doneness, if the dough looks cooked, spray the top (be careful not to spray the grill or it may cause a fire) and turn the dough over. Go to the next step immediately. Brush on the sauce, then add the ingredients and finally the cheese. Close the grill top and grill till the cheese is melted. Be sure to check the bottom of the pizza to make sure it is not burning. Remove from the grill and let set a few minutes before cutting.